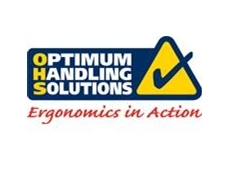 Optimum Handling Solutions supply specialised solutions that are designed to eliminate hand lifting when loading and unloading palletised goods. These equipment and materials include scissor lift tables, fork stackers, stretch wrapping equipment, racking shelving, conveying and palletising systems. 04/11/13 - Optimum Handling Solutions offers a comprehensive range of dangerous goods storage cabinets specially designed to assist with the safe and compliant storage of all hazardous materials and substances. Storage and handling of dangerous goods demand strict compliance with legislative requirements as per Australian Standards. There is an obligation to store dangerous goods, even in minor quantities in accordance with the principles and guidelines set down in the relevant Standard. Even relatively small quantities of flammable and combustible liquids such as paints and thinners, certain inks and alcohol should be stored in approved flammable liquids cabinets. 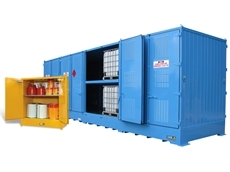 Dangerous goods storage cabinets from Optimum Handling Solutions provide a suitable solution for storing flammable, toxic or corrosive liquids. Optimum’s internal dangerous goods storage cabinets are ideal for storing smaller bottles and drums from just 30Lto a huge 850L. Featuring adjustable internal shelving and gas strut assisted locking doors, these cabinets are very user-friendly. 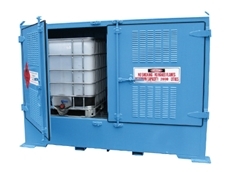 For higher storage volumes of 205L or IBCs, Optimum supplies outdoor relocatable dangerous goods storage units as a user-friendly and space-efficient solution for all industry segments, eliminating the need to build fixed stores. With capacities ranging from 820L up to a massive 26,000L, these units will provide a safe solution for complete storage requirements. All dangerous goods cabinets by Optimum Handling Solutions are manufactured in Australia and built to Australian Standards. 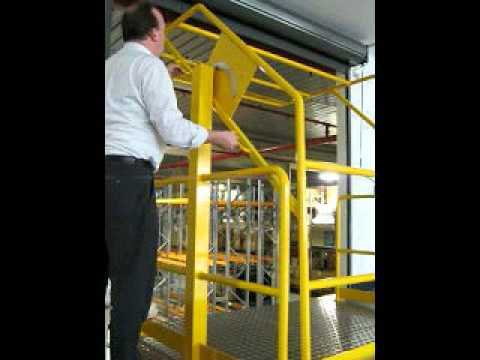 22/10/13 - Optimum Handling Solutions recently supplied one of their electric goods lifts to a large food processing plant. The national company needed to efficiently elevate pallets to a roller door opening in the top storey of their building where pallets of flat packed cardboard boxes were required for the box making machine. Optimum Handling Solutions supplied a heavy duty 2000kg goods hoist with 9m travel and a goods cage designed to handle two pallets per cycle. The simple controls ensure user-friendly operation while its interlocked doors and anti-drop feature increase the safety factor. 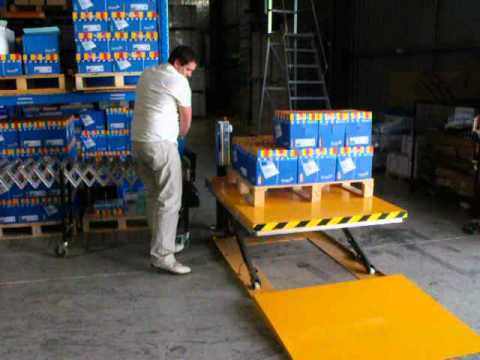 Previously, all pallets had to be carefully manoeuvred one at a time by an experienced forklift driver up to the door opening, which was not only a very tiresome process but also impacted productivity, especially when 32 pallets get delivered each day. 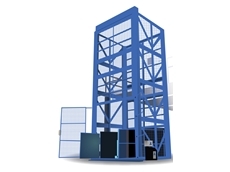 Goods hoists and mezzanine lifts greatly assist any operation with elevating goods. 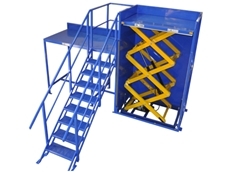 Optimum Handling Solutions can supply systems from simple 250kg mezzanine lifts for nuts and bolts to more complex 3000kg heavy duty lifts with 12m travel. 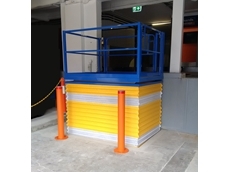 23/09/13 - Scissor lift tables from Optimum Handling Solutions can increase load-out rates when utilised to their maximum capacity. Food and beverage manufacturers can, for instance benefit from the implementation of Optimum Handling Solutions scissor lifts when despatching finished goods. 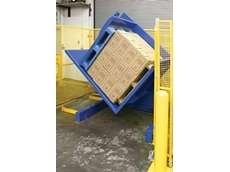 The common load-out room conveyor continually feeds the packaged products to the operator, who loads them onto pallets for dispatch. When fitted with the Logic lift photo eye, the scissor lift automatically maintains a comfortable working height platform to reduce the operator’s back strain or bending and stretching injuries often associated with the stacking of pallets. 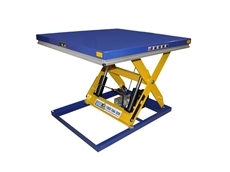 The low profile scissor lift tables can also be utilised where forklifts are not accessible. Optimum Handling Solutions offers a comprehensive range of solutions for conveyor, scissor lift and various materials handling requirements. 09/09/13 - Optimum Handling Solutions introduces the new Pal-Tec pallet inverters designed to transfer palletised products quickly, safely and efficiently. Pal-Tec pallet inverters are ideal for fast transfer of product, cutting out the arduous and time consuming process of manual restacking of goods. Allowing transfer of goods from pallet to pallet in 90 seconds, the pallet inverter helps increase productivity and reduces worker fatigue in packaging and palletising operations, overcoming all material handling issues with ease. Pal-Tec pallet inverters are ideal for situations involving manual transfer of product from damaged pallets to acceptable pallets, from hired timber pallets to plastic pallets or even when inspecting stock. Featuring a small footprint and designed to suit all standard pallets, the Pal-Tec pallet inverter is operated by a forklift driver from the seat using a remote control post. The heavy duty yet simple-to-operate inverter unit is supplied with safety fencing on all three sides and can be specified with safety cut eye beams at the entrance. 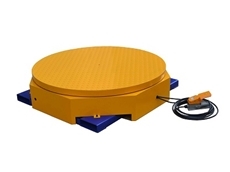 Optimum Handling Solutions offers a wide range of specialised materials handling solutions.